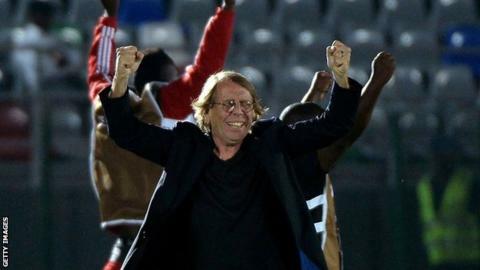 Congo's qualification for the quarter-finals of the Africa Cup of Nations was a remarkable achievement for an unfancied side, but also a personal triumph for coach Claude LeRoy - one of the grand old men of African football. Frenchman LeRoy, 66, has managed five different African national teams since first taking charge of Cameroon in 1985. He has coached at eight Cups of Nations and has now reached the quarter-finals on seven occasions, winning the trophy once. BBC Sport caught up with LeRoy to find out more about his extraordinary journey - and what continues to drive his passion for African football. LeRoy had an unspectacular playing career at a succession of middle-ranking French clubs before taking his first job in management at Amiens in 1980. After five years in France, he was offered the post of Cameroon manager. He jumped at the opportunity. "My father fought for the independence of [former French colony] Algeria," he explains. "That means as a kid I heard a lot about Africa and a different world. "When I arrived, I was very, very young. Some players were the same age as me, like Roger Milla and Theophile Abega. "We left Cameroon for five weeks in Brazil and four weeks in Germany. We played one match in the Maracana. "It was the beginning of a fantastic story, and a love story, first with Cameroon and then with Africa - and not only for me, for my wife and my daughters [too]. I don't know if it's a beautiful story for Africa but it's been a beautiful story for me." LeRoy guided Cameroon to the Cup of Nations final in 1986, losing to Egypt on penalties, before going one better in the 1988 tournament in Morocco. His side won the trophy with a 1-0 victory over powerhouse Nigeria in the final. LeRoy's next assignment was with Senegal, whom he steered to fourth place at the 1990 Cup of Nations, followed by a quarter-final exit in 1992. Former Senegal player Salif Diao believes LeRoy's work laid the foundations for the country's subsequent success on the international stage. "He did a great job in Senegal," Diao told BBC World Service's Sportsworld. "He set up a really great base, working with the youth. "He had the team in 1992 and I would say 10 years later in 2002, when we [finished second] in the Africa Cup of Nations [and reached the World Cup quarter-finals] it was coming from the work he did." Diao believes that LeRoy's insistence on living in the country he coaches, unlike many foreign managers, is key to his success. "Africa is very mystical," he says. "You need to be there to understand all of it. "It's not only about the game, you also have to know about the country, where you're going - the different ethnic groups because you have to know the different mentality of the players." LeRoy briefly returned to take charge of Cameroon for the 1998 World Cup, and then had spells at Strasbourg, Shanghai and even Cambridge United. But it was in Africa that his heart lay, and he returned in 2004 to take charge of DR Congo. "In a country like DR Congo, 78 million people are completely crazy about football," LeRoy says. "In other countries - even in Brazil - you get a lot of people who say, 'Oh no, I don't care about football.' That never happens in Africa." LeRoy's commitment to immerse himself in his chosen country may have won him the respect of the locals, but it has also exposed him to the unique pressures of satisfying a football-mad populace. "When people in Europe talk about pressure, I'm always laughing, because the pressure in Europe is nothing," says LeRoy. "[Give them] two or three weeks in Africa, then they will see what is pressure." But LeRoy has made a habit of delivering under pressure. Against the odds, he took DR Congo the Afcon quarter-finals in 2006, before throwing his lot in with Ghana. A third-place finish at the 2008 tournament duly followed. The Frenchman says that the perks of his nomadic existence comfortably outweigh the stresses of the job. "To be a traveller with shoes of wind like me, I'm sure I am a little bit lucky," he says poetically. LeRoy believes that his earning his living abroad has insulated him from some of the disenchanting changes in European football. "I love more and more the game of football but I hate more and more the world of football," he says. In a thinly veiled reference to meddling owners, he adds: "Since the first day in Africa, everybody understood that if I cannot work how I want, I was ready to take the first plane back. Nobody can force me to do anything." Le Roy returned to DR Congo in 2011, but his second spell was less successful. He failed to get the team out of a tough group at Afcon 2013 - the one black mark on his excellent Cup of Nations record. Many would have predicted the same fate for a Congo side that had not won an Afcon game for 40 years prior to this year's tournament, but against the odds LeRoy is in the last eight for the seventh time in his extraordinary, nomadic career. Will this post be his last? "In 2019 the Africa Cup of Nations is in Cameroon and maybe it will be the perfect time to finish the circle. The beginning of everything in Africa was in Cameroon," says Le Roy, who celebrates 50 years in football this June. His former players will not let him go quietly. "Some of my players - Michael Essien, George Weah - want to organise a huge jubilee," he says. "I don't know where, but we will see!" A party thrown by some of the continent's most illustrious stars. There could be no more fitting send-off for a man who has dedicated his life to African football.